This book launch event at Hugh’s Room on December 5 looks great: Brian Walsh, Steve Bell, Mike Janzen… it’s the confluence of some brilliant and talented people in support of what looks like a great book. Bruce Cockburn, along with Leonard Cohen, Gordon Lightfoot and Daniel Lanois (I’m also tempted to add John K. Samson to the list) is one of Canada’s greatest songwriters, and the always-incisive Walsh (author of “Colossians Remixed” among other things and Reformed Chaplain at the University of Toronto) is not only his biggest fan but has frequently taken on the mantle of being his unofficial theological interpreter. I’m hoping to hear at least one cover of “Lovers in a Dangerous Time.” Full details here. 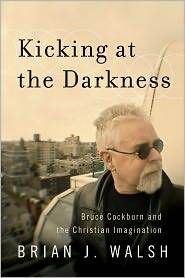 Dr. Walsh has been writing on the theological significance of the art of Bruce Cockburn for many years. Cockburn seems bemused by his interest. Are Artists the High Priests of Culture? You can fill in your email address to get new blog posts via email.